Today is going to be one of those “my own opinion” posts! Please feel free to leave comments that share your favorite materials and methods for today’s topic. 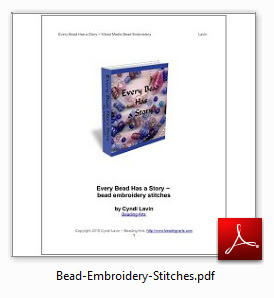 And don't miss the link at the end where you can click to download a free chapter of my bead embroidery e-book, Every Bead Has a Story! 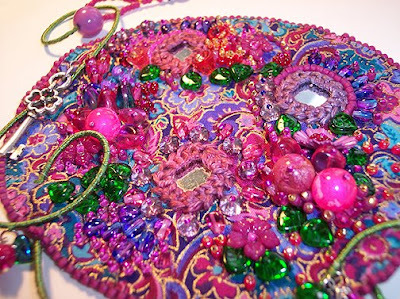 I am frequently asked for the specifics of how I make my bead-embroidered pieces. 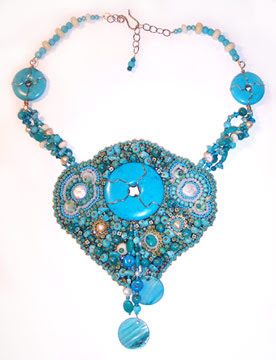 You can see examples of my bead-embroidered necklaces here. I’m totally sold on using buckram for my beading layer, rather than some of the more expensive products marketed specifically for beading. Even when I’m embroidering directly onto something like a heavy felt hat, I sometimes still use buckram or another lighter weight interfacing behind the felt. Buckram is a heavily starched woven cotton interfacing, used in millinery and belts. It’s very thin, but holds its shape well and practically never unravels. It can be painted or dyed and heat-set before beading, which is what I do in some of my work. 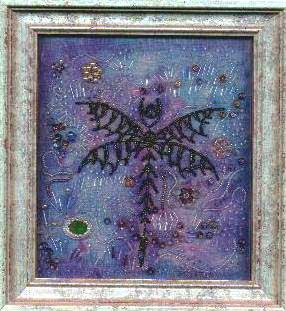 The piece shown above uses a painted background with some rows of clear beads…it’s hard to see in the photo, but I beaded a bit more loosely than usual so that the color could show through. Here’s another example, a non-wearable piece, where the painting on the fabric is more obvious. And here’s a piece where the commercial fabric that I used was backed with buckram first to keep it from drooping and puckering. I buy buckram at Joann’s, in the interfacing section, and is very inexpensive! Once it is thoroughly beaded, it becomes softer under the weight of the beads so that it will drape around a neckline, but it still doesn’t tend to lose shape. When I’m beading a piece that I know is going to end up being particularly heavy, I sometimes use an ultra-suede type of material. This is what I always use for the backing too. I am very fussy about the looks of the entire piece, so the backing is glued lightly to the buckram, and all the raw edges are beaded together to cover them completely. Nymo thread is my choice for almost all bead embroidery. Occasionally with very heavy beads, a heavier carpet thread may be called for, but I’ve found Nymo comes in enough sizes to suit my projects. I buy large spools of black and of white Nymo in size 0, which is one of the thinner sizes. I don’t bother with colors…if I want a colored thread, I use a permanent marker and run the white nymo over it. My needles of choice are English beading needles, and I usually buy those packets that have 6 or so needles ranging from #10 through #12 or #13. The higher the number of the needle, the smaller it is, so #12s are great for beading with 11/0 seed beads. You’ll need finer needles (with higher numbers) to work with smaller beads and fresh water pearls. So, that’s my run-down! What do you like to use the best? Thank you for the wonderful specifics and details you've given, especially about using buckram instead of more expensive type products. You even listed where to buy it, at Joanne's! I've used permanent markers to color thread but thought I was "cheating." LOL. So glad to see that this is, in fact, a legitimate method! Can't wait to give this all a try. Hoping to read much, much more. CatherineTodd2 at gmail dot com. Catherine, there is no such thing as cheating in artwork ;-) Don't let anyone tell you differently...there are many ways to achieve the same goal, and I'm really glad you've found this helpful! Gracias, amiga... love the inspiration and encouragement I'm finding here! We do all kinds of beautiful beadwork with the Mayan artisans here at Lake Atitlan, Guatemala, where I live most of the year. I am definitely going to see if we can do more bead embroidery. They do some right now for beautiful "ganchos" (large oval beaded hair accessories with short sticks that go through them) and hair barrettes. We could do lots more things as well. They are so creative, it's unbelievable. Write me for more info & photos if you want: CatherineTodd2 at gmail dot com.